There have been many moments in this food and travel writer’s life where I would say, “Please pinch me. 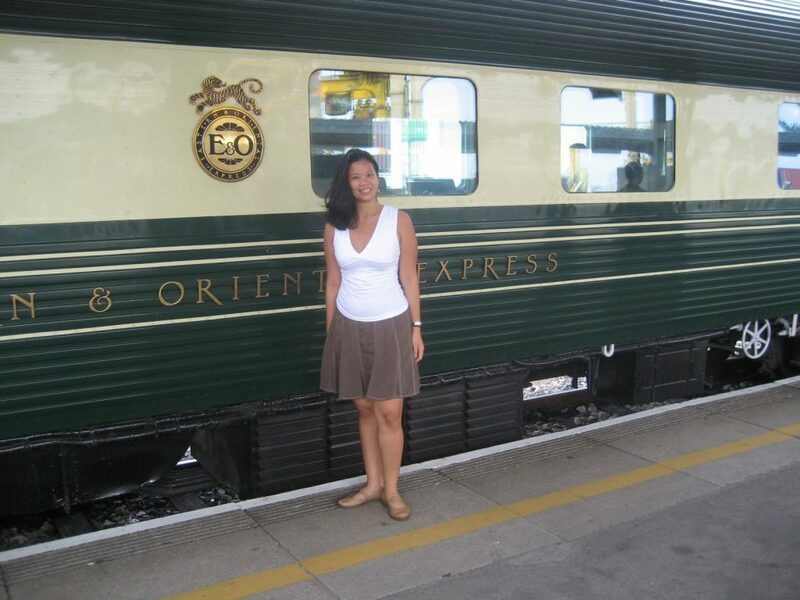 Is this really happening?” One of my favorite moments in my life is traveling on board the Eastern & Oriental Express to eat my way through the 2,030 km peninsula. 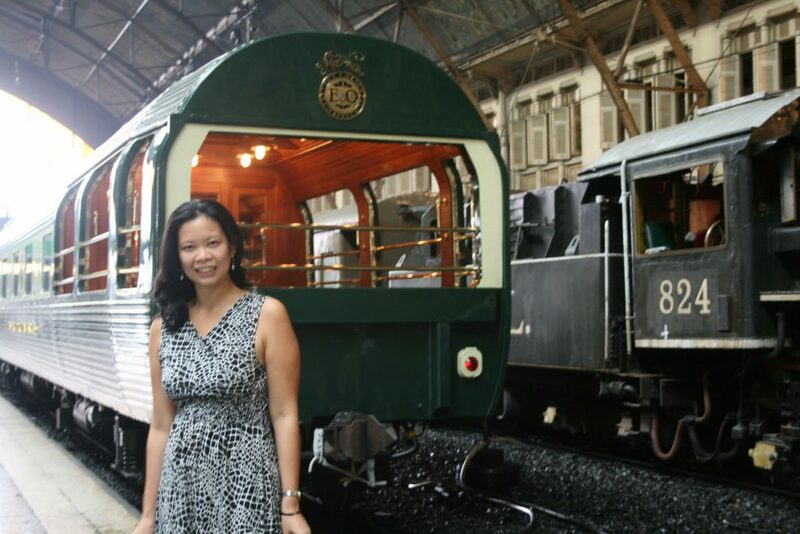 My food trip required me to travel onboard the luxury train from Bangkok passing through Malaysia, ending in Singapore. It was a three-day, three night journey. 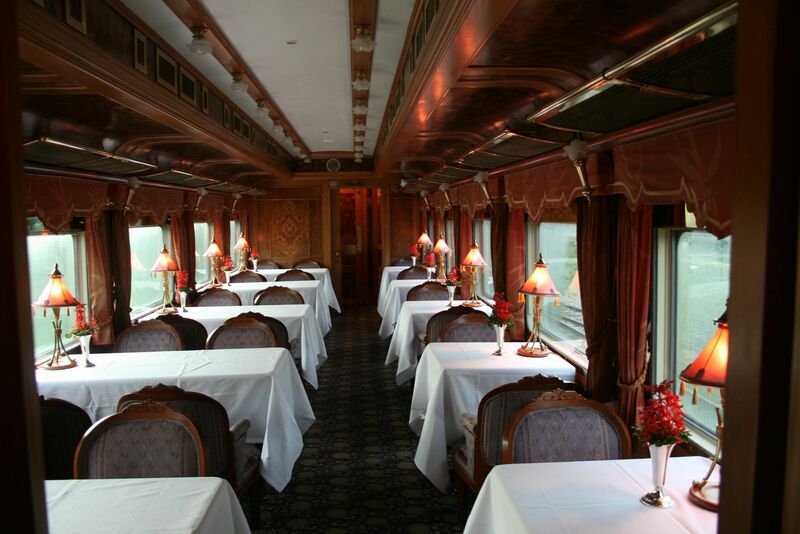 Passengers share this magical experience in 22 private carriages, two dining cars, a bar car, a saloon and an open-air observation car. I had pitched an article on “Dining on the E&O” to Business Traveller Asia Pacific. My editor, like a fairy godmother, magically granted my wish and commissioned this story. 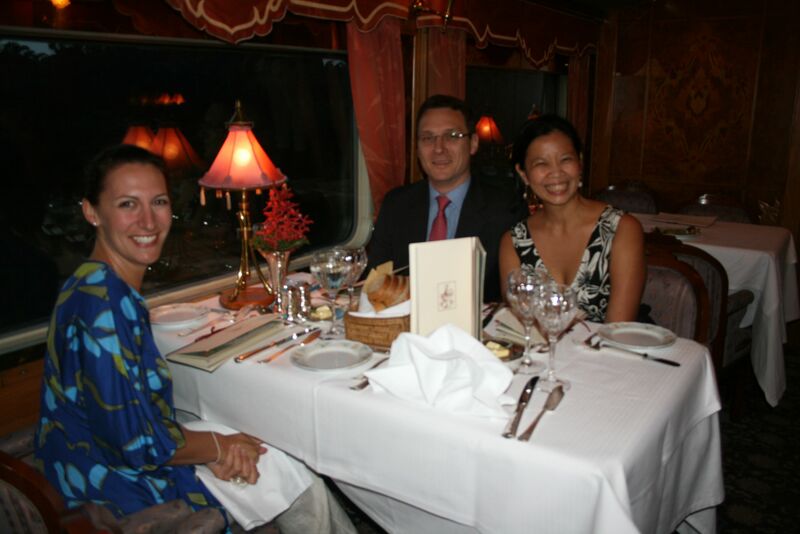 So I was to experience dining on this once-in-a-lifetime luxury train ride. The journey in itself was the experience. 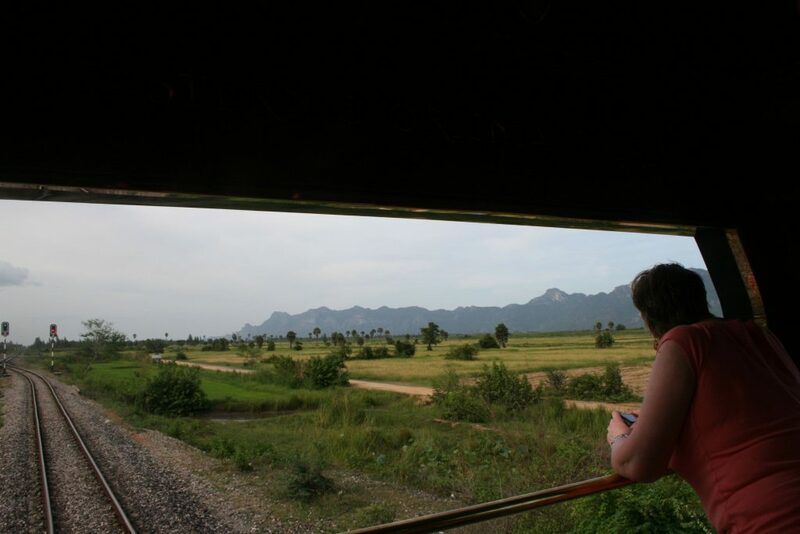 As the train traversed scenic vistas of sugar and rice fields in Thailand, the mountains and rubber plantations of Malaysia, and gently ending up in Singapore’s urban jungle. Meals required a suit and tie for men and a cocktail or evening dress for women. I came prepared with pretty dresses to match the train’s posh interiors. 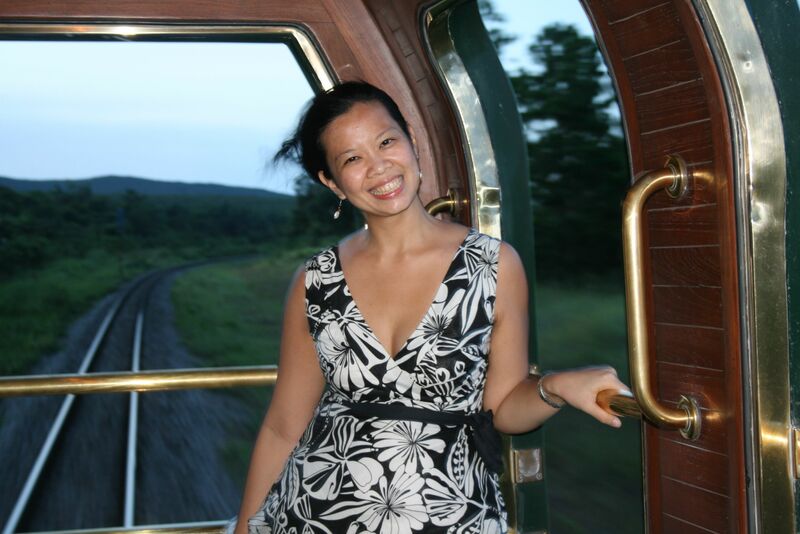 The menu for each meal is carefully designed to match the view seen on the train’s windows. As we traveled through Kanchanaburi, they brought out the Rolled Masala Chicken on Lemongrass Risotto, accompanied by Fragrant Siamese Yellow Curry Bouillion. 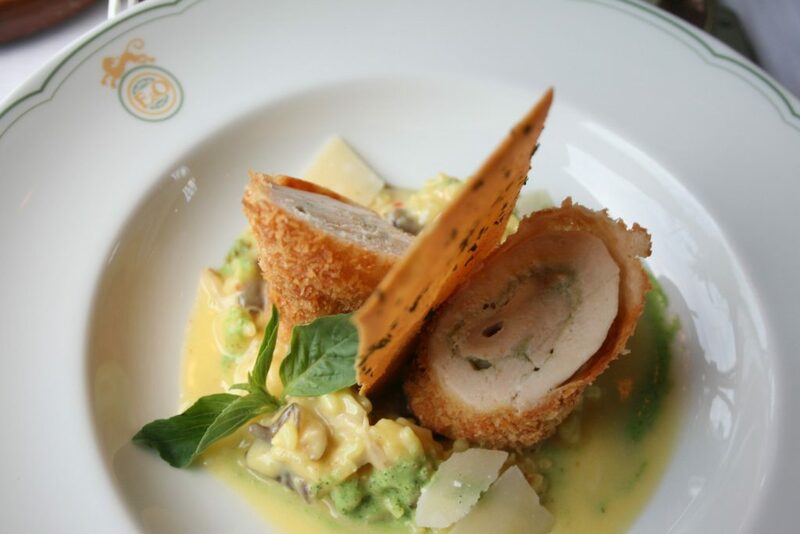 This Thai inspired basil chicken roulade nicely paired with the tangy lemongrass risotto cleverly matched the tropical Thai setting outside. 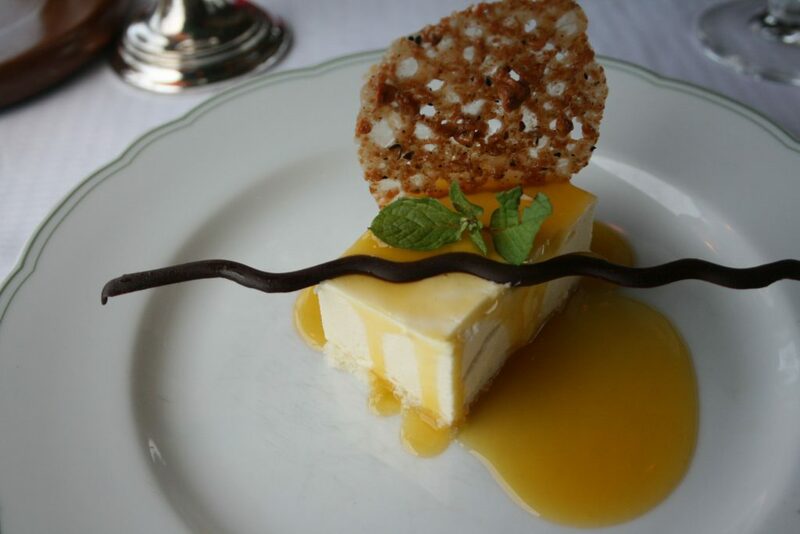 The dessert was a refreshing Passion Fruit Cheesecake. 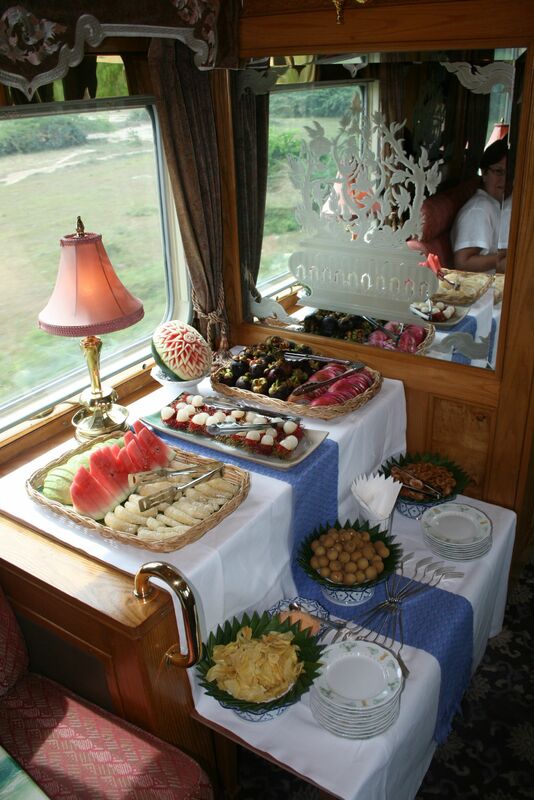 In between lunch and teatime, Thailand’s abundance of exotic fruits such as the mangosteen, pomelo, chico, rambutan, and dragon fruit are served, with an artist demonstrating the fine details of fruit carving inside one the train’s dining carriages. 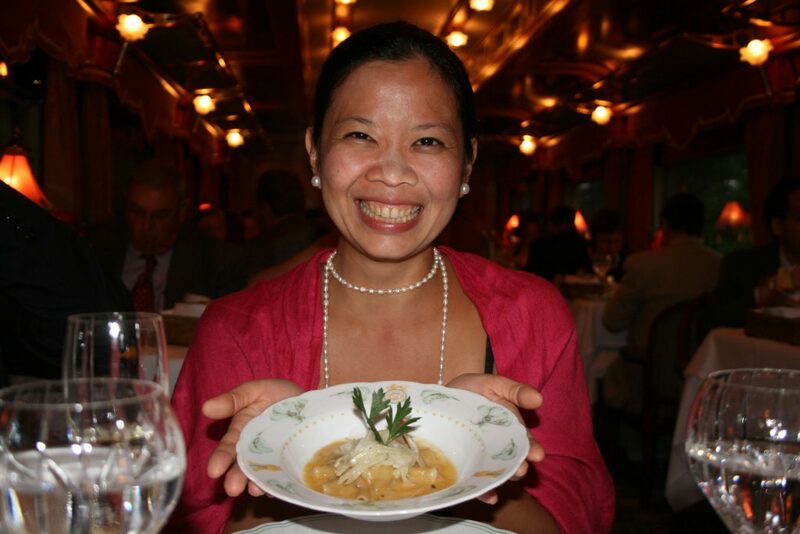 One of the most memorable dishes was served on my last night on the train. It was the Wonton of Goose Liver in Truffle Bouillon with Crisp Fresh Fennel Salad This most glorious burst of decadence seduced my tongue with the delicate wonton skin, tender liver and rich sauce broken only by the unexpected crunch of fennel. I dreamt about this dish for days. 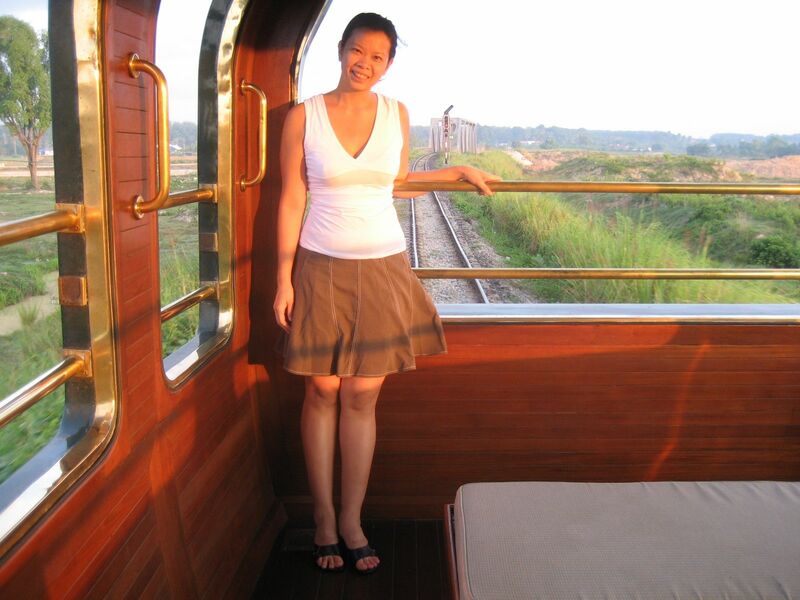 While I came prepared for a hearty appetite, pretty outfits, pearls, and make-up to dine in this luxury train, this single lady did not come with a travel companion. I feared I’d be eating alone during my entire train ride. Catering to the most seasoned travelers on board including top hoteliers, psychiatrists, journalists, businessmen, and retirees, the E&O does not leave any detail left unattended to. Seating at every meal is meticulously planned. They even seat strangers together to encourage socializing among passengers. My first meal was with a dad and traveling with his two young sons. There was dinner with a Singaporean couple and a German gentleman. I had instant chemistry with the lovely American mother and her daughter, who had just separated from her husband. We laughed throughout dinner, as we sipped our wines, even planning our reunion meal in Singapore. On my last night, the maître d’ told me there was a problem. Two different groups of people requested to dine with me. I was amused how this single lady had become a popular dining companion in the E&O. 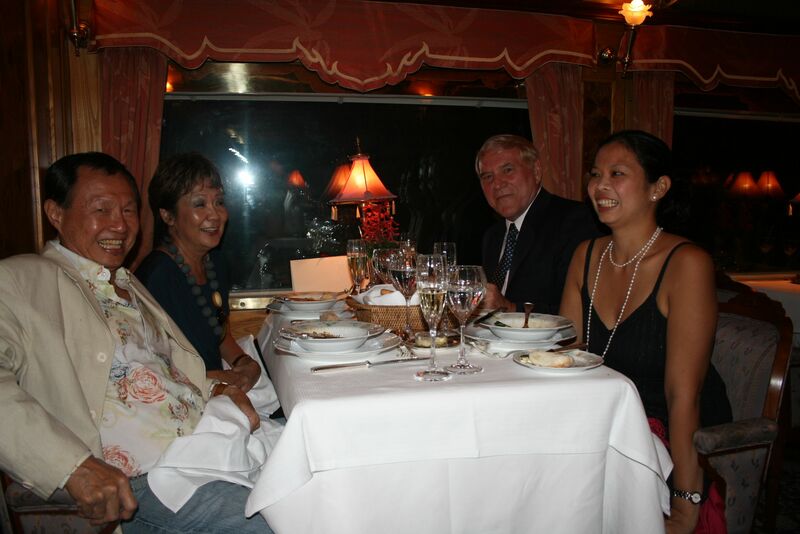 A Singaporean couple, a German gentleman, and myself make for interesting dinner conversation! 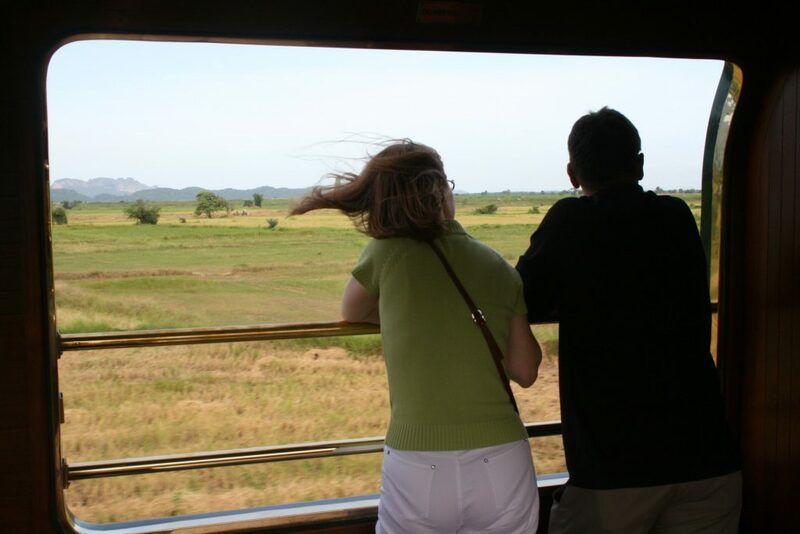 There is never a dull moment on the train with an opportunity to meet with a fortune-teller, get a foot massage, sit in the reading room, admire the view at the observation car, have a drink at the Bar Car, or even sing songs with your newfound friends as a pianist played classic tunes. 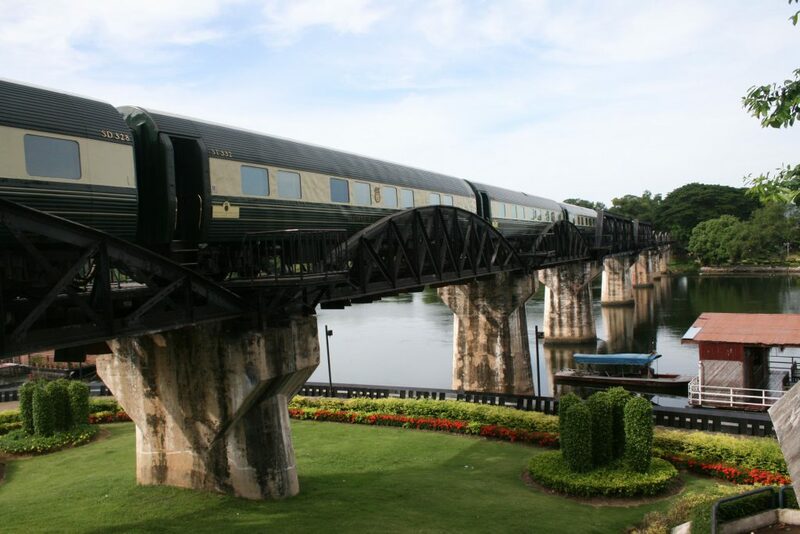 There are stops along the way, allowing for excursions to the River Kwai’s Thai-Burma Railway and historic Georgetown. Drinks and Singing with these ladies, where language or cultures are no barriers! 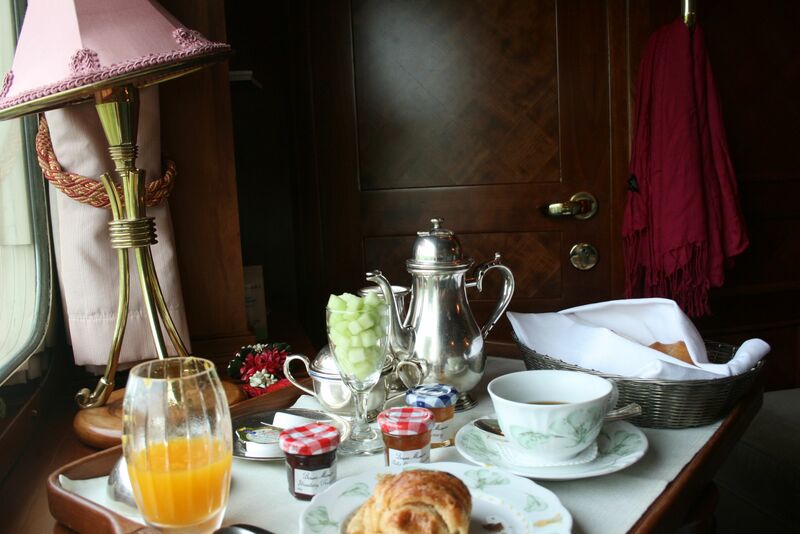 But probably the sweetest memory is relishing the moments alone in your own private compartment. Each compartment is your own compact domain, with its own en suite shower. It is designed for hours of gazing at the picture window, soaking up the ever-changing views outside. At night, your steward magically transforms your cozy compartment from a living room into a comfy bedroom. 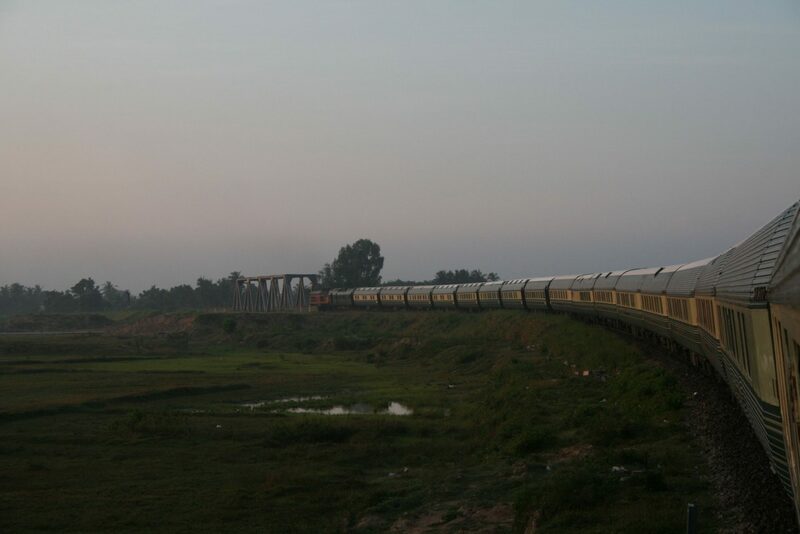 In this fast-paced world, I welcome the charm of this luxury train journey. The E&O celebrates the nostalgia of the old world, a time when people dressed for travel. It was a time when getting from one place to another entailed days, instead of hours. But it also meant savoring the journey as much as the destination. It meant slowly enjoying delicious meals with a view, making friends along the way, and appreciating where you are at your own life’s journey.